Lumbar corpectomy is a treatment for back pain, which involves the fusion of two vertebral bodies together. We have networked with pre-screened healthcare facilities to provide quality treatment to people who are looking for affordable spine surgery abroad. Lumbar Corpectomy in Korea is available at an affordable cost. It is a surgical treatment for back pain caused due to compression of spinal cord and nerves. 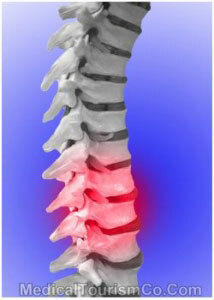 This compression occurs when diseased or damaged vertebrae bone block and pinch the spinal cord. Spinal fracture, tumour, or infections are the major reasons for the damage of the vertebrae, which in turn cause compression of the spinal nerves. The damaged or diseased vertebrae bone along with the discs above and below the bone are removed. The vertebral space after the removal is cleared and prepared to receive a bone graft. The space is then closed by inserting a bone graft tightly into the space. A metal plate called Zplate is fixed as a bridge between the bone graft and the adjoining vertebrae. This plate keeps the area secure while the bone heals. During the healing process, the bone graft fuses with the adjoining vertebrae, creating one solid bone segment. All medical expenses such as surgeon’s fees, anaesthesiologist’s fees, pre and post operative expenses, etc. Private transportation between airport and hospital/ hotel. Private transportation for all medical appointments. English speaking medical staff or an interpreter. 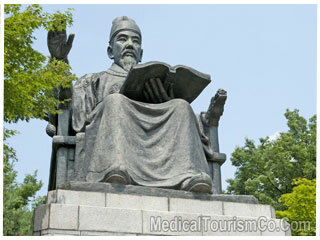 Assistance in tourism related activities if desired and approved by the surgeon. Charges for any complication that might arise during or after the surgery. Before deciding the surgery, a pre-operative evaluation of the patient’s condition is required. For patients considering treatment of spinal problems in Korea, the evaluation is based on a medical questionnaire. The patients might be required to share X-ray, MRI and CT scans of the spinal cord depending on the surgery team’s requirement. We will assist you in all the preparatory steps. Entry requirements: Passport is required by everyone. Citizens of USA do not need a visa for a stay up to 90 days. Canadians do not require a visa for a stay of 180 days. For other countries, please contact us as soon as you decide on the surgery. Medical tourists are advised to carry a photo-identity card with them. Carry all your health related documents while travelling to Korea. Lumbar Corpectomy Surgery in Korea is offered at a JCI accredited hospital in Seoul. The surgery team consists of internationally trained and experienced surgeons. We endeavor to provide high quality treatment to our overseas patients.